Since the 1st of January Dr. Jörg Blumhoff, the previous authorized officer and marketing manager of ORGANICA®, takes the management of the company over. The baton is thereby handed over by Dr. Bodo Schulze who co-founded the enterprise in 1995 and had a formative influence on it. Nevertheless Dr. Bodo Schulze will remain as a consultant. ORGANICA® looks back at the most successful business year of the present enterprise activity. Thus the turnover in the business year 2016 amounts to 15.5 million EUR. Thanks to the good result ORGANICA® plans investments at the rate of 1.5 million EUR for the year 2017. With this budget the product capacities should be extended and made more flexible to be able to meet the challenges of the future. In September the new thermal regenerative exhaust gas cleaning of ORGANICA® was taken into operation, so that also in future the highest environmental standards to kept ones become. In December our new tank farm has been put into operation. It was realized in two construction phases. 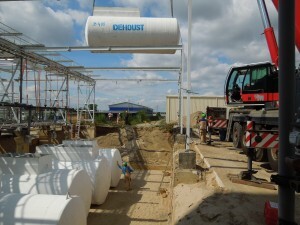 The 11 new tanks (4 x 30 m³, 2 x 25 m³, 3 x 20 m³, 2 x 16 m³) allow us to store 245 m³ (toxic substances: 110 t). In January a new warehouse for EU pallets was build. 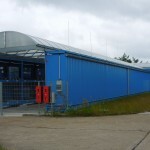 This unit increases the storage capacity of ORGANICA® by 148 EU pallet storing positions. Increase of production capacity at ORGANICA®! 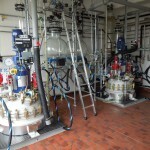 Two new 500 liter reactors were put into operation wherein reactions up to 230 °C can be performed. The assisting glass containers for reacting agents are heatable. In addition vacuum destillations down to 10 mbar are possible. 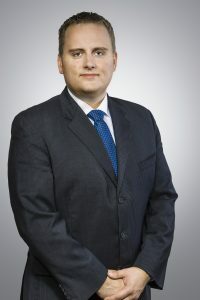 Based on purchase agreement dated 30 November 2011 WITEC GmbH (loacated in Laasdorf, Thuringia) acquired 94% and their Managing Director, Mrs. Anastasia Zepik acquired 6% of the shares of Organica Feinchemie GmbH Wolfen. Mrs. Zepik was also appointed as Managing Director of ORGANICA® Feinchemie GmbH Wolfen. 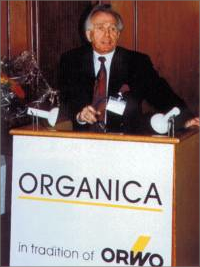 Dr. Bodo Schulze, co-founder of the ORGANICA® in 1995 and since then also Managing Director, will perform this function until 2016. Thus, the continuity of successful client relationships and business development is secured. ORGANICA started mass production of high purity dyes for dye-sensitized solar cell (DSSC). Dye-sensitized solar cell (DSSC) are based on a sensitizing dye as light-absorbing material, creating the electrons as power generator. The DSSC, which is typical for the third generation solar cell, has made phenomenal progress since its discovery 20 years ago. 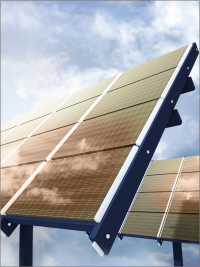 Conversion efficiencies of over 12 percent and excellent stability have een reached rendering it a credible alternative to conventional p-n junction photovoltaic devices now. DSSC have become viable contenders for large-scale future solar energy con- version systems on the base of cost, efficiency, stability and availability as well as environmental compatibility. 5 years ago ORGANICA started with the development of improved synthesis procedures, enabling the company to scale up this production into multi-kilogram- scale. In connection with the larger production scale ORGANICA themselves was able to reduce the production cost as an important condition for the competitiveness of large-scale industrial DSC production, able for substitution of silica based photovoltaics. The first developed synthesis of sensitizing dye by ORGANICA was Dye N719 (code 11070), the most common high performance dye at present. Dye N719 was followed by Dye Z907 (code 11092) which offers great long term stability of DSSC performance. 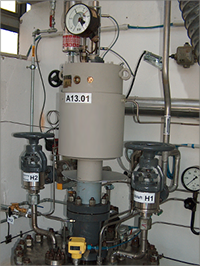 2009 the industrial synthesis of first Energy Relay Dye PTCDI (code 57490) was developed. The PTCDI gives additional light harvesting by absorbing higher energy (blue) photons. This makes the overall absorption spectrum wider for the same film thickness. In 2010 the development of synthesis of DyeC106 (code 58310) was finished. This dye gives better yield in light harvesting and increases the cell efficiency up to 11.4 %. ORGANICA offers these dyes from gram to kilogram scale. The sale of DSSC dyes in kilogram scale can be made only to companies who have received a license from the Ecole Polytechnique Federale de Lausanne (EPFL). 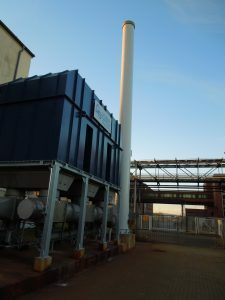 A new incinerator for exhaust air will guarantee that the air pollution is limited strongly below the limit of the new German regulation TA- Luft. On June 1st 2007, Inspectors from the FDA, Mrs. Helen Ricalde (New Jersey) and Mrs. Yvonne McKnight (Philadelphia) concluded their 4- days inspection of Organica’s facilities for the manufacture of diagnostic dye Indocyanine green. They confirmed the cGMP suitability for the manufacture and analysis of this dye. The production takes place in the kilo- lab under cleanroom grade 7 (10.000). New diagnostic techniques from Pulsion Medical Systems AG and the US company Novadaq Technologies Inc. indicated a demand increase of Indocyanine green in the US market. Based on the current factors, ORGANICA will expand its offers in GMP custom syntheses and invest more in new corresponding production facilities. 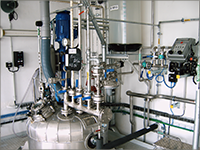 Installation of a new production line for reactions based on carbon disulfide: stainless steel reactor (630 liters), glass-lined crystallizator (1600 liters) and a PP-filterpress. For DVD+R and DVD- R the new Dye 10930 with higher climate and light stability was introduced to the market. ORGANICA together with FEW Chemicals developed the first European DVD- R dye – Dye 967. Development of first dyes (Dye 393 – 03930 ) and intermediates for recordable optical disc with high density. A new cGMP – Kilo lab was built up to start the manufacturing of diagnostic and therapeutic dyes as well as other parenteralia. Development and scaling up of new PMT- substitutes (00610, 05470, 05630) from Bilas. The Organic Synthesis Department of the former Filmfabrik is privatised under the name ORGANICA Feinchemie GmbH Wolfen. The product programme includes photo- chemicals, especially stabilisers, antifogging agents, hardeners, spectral sensitisers and dyes; pharmaceutical intermediates such as 4- Fluorobenzylamine (00450), 4- Iodoaniline (00040) and Potassium Phthalimide (00320); fine chemicals for general purposes such as Malondianil (45410), Glutacondianil (13710), Butane sultone (13671), Rhodanine acetic acid (13500) and several special heterocycles, i.g. 2,3,3- Trimethylbenzoindolenine (13700). Today, ORGANICA possesses the Know-How to manufacture about 2.500 compounds as optimised laboratory processes and pilot- scale or large- scale production procedures. Custom Manufacturing is an important activity and may be done under secrecy agreement if required. The process may be that of the customer or may be developed in- house. ORGANICA Feinchemie also offers Laser dyes and other dyes for the micro- electronic industry and life science diagnostic industry as well. A special catalogue may be sent on request. The Filmfabrik Wolfen GmbH is incorporated. Alongside photochemicals the sales of fine chemicals are started. The ORWO Filmfabrik is transformed to a public stock company and increasingly follows the orientations of the world market. The chemicals produced by the department Organica start to be marketed world wide. 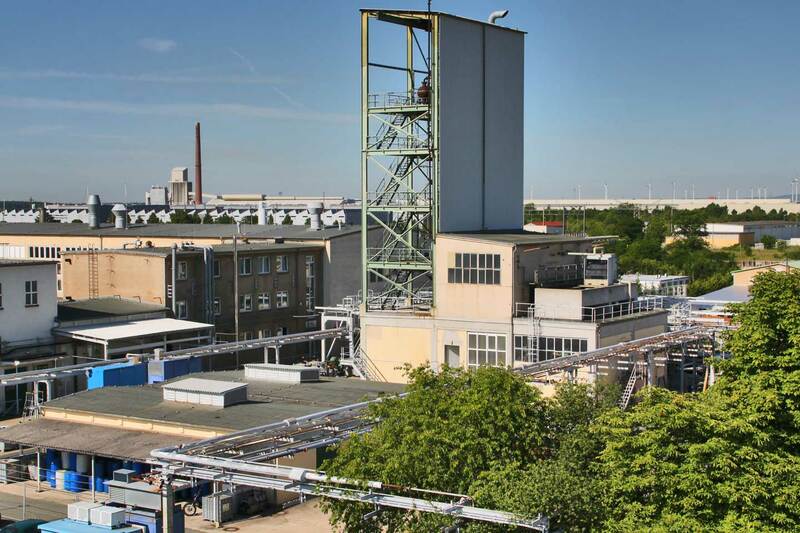 Altogether since 1945, 297 chemical products have been used in the production of more than 150 Silver halide materials, most of them from the organic synthesis plant of the Filmfabrik in Wolfen. There were forty- nine colour couplers, twenty- seven stabilisers/antifogs/antioxydants, sixty spectral sensitisers, forty- five compounds for the emulsion, thirty- four filter, antihalation and correction dyes, fifteen hardeners, fifteen wetting agents, nineteen polymers and thirty- three other photographic elements. After a short period of import, the first oil- couplers are produced in- house in the new pilot plant. The research work of Birr/Walther/Fischer/Engelmann concerning antifogging agents, in parts with advanced solubility through substitution with Carboxy, Hydroxy and Sulfo groups is concluded. Some of them are introduced into industrial production. Examples of these compounds are: 1- Phenyl- 5-mercaptotetrazole (12580, PMT), 4- Hydroxy- PMT (12090), PMT- Disulfide (12430), Tiron (12200), 6- Amino- 2-thiouracile (12230), 3- Mercapto- 1,2,4- triazole, 3- Mercapto- 5-phenyl- 1,2,4- oxadiazole, 4,5,6,7- Tetrachlorobenzotriazole. The production procedures of twenty- two oil- couplers including the appropriate intermediates for the new colour system are devised. The mechanism of photographic stabilisation and all stabilisers are summarized in a monograph written by Birr. In a second monograph which is being in progress , Fischer will bring together and evaluate all 2293 patents in the field of stabilisation until 1988. At the beginning of the 70′s, it appears that the cine materials manufactured by ORWO which includes the long- chained couplers for processing with colour developer T22/CD1 cannot be treated analogous with the most common colour systems in the western world. The processes ECN II and ECP II with developers CD2 and CD3 are used. Although the sales remain constant, research work is launched to synthesize and applicate the so- called oil- couplers. After 1970 Plaschnik successfully introduces hardeners of Cyanur acid and Carbamoyl type for high temperature processing of advanced colour films (12070). Thiobarbituric acid pentamethine oxonole 13460 is used in the high- end film NP 15. Due to its capability of forming Silver salts at both auxochromes, it increases the definition in black- and- white films. The Filmfabrik in Wolfen starts trading under the trade mark ORWO (ORiginal WOlfen). Research for sensitisers continues. Some 500 others are synthesised through electrophilic and nucleophilic substitution as well as by inclusion of Mercapto and Alkylthio groups. The 6- Bromo- Sta- Salt and the 2- Methylthio- Sta- Salt (32740) are successfully tested. Antioxidants are increasingly used as antifogging/antihalation agents in photographic emulsions. Walter and Fisher worked on these products. Spirobisindane 12422 is still an actual example. Blue sensitisers make up the last group for antifogging/antihalation of emulsion and layers. Eiserbeck already used a short- waved absorbing Merocyanine in the manufacture of nuclear emulsion plates in Wolfen. Advanced blue sensitisers (12810, 12930, 12950, 33020, 33030, 33290) are used for colour materials. Up to this time, gelatine layers in film materials are hardened with Glyoxal, Diacetyl and Chromoacetate. This is not sufficient any longer, especially for the development of black- and- white cine film in tropical countries. Within one year, Walter develops and applies for a patent better performing organic hardening agents with Epoxy, Acryl and Aziridine groups. On the basis of the discovery of Meyer concerning the use of inner salts of the Cyanine dyes, Bruncken/Bach/Eckert/Großmann develop sensitisers for the green (12840, 12850, 12910) and red spectrum (12860, 12880, 17350, 33260, 33270) and use them in black- and- white as well as in colour materials. As quaternation agents Propane sultone, Butane sultone, cyclic Sulfates and Halocarboxylic acids are used. Bach and Ebersbach successfully rationalise the manufacture of spectral sensitisers by using their new one- pot procedure. Three- nuclei Cyanines with different heterocycles as auxochromes are developed as special red sensitisers, sometimes with distinctive “green gap”. Bruncken produces particular Merocyanines as green sensitisers for X- ray photography and printing materials. The Filmfabrik is handed back to the GDR and the VEB Film- und Chemiefaserwerk AGFA Wolfen is founded. Until 1950 the filter and correction dyes are produced in Wolfen by the Filmfabrik and the Farbenfabrik in the neighbourhood. Some of these are: Zaponecht blue 3G C.I.51004, Cellitonecht yellow G C.I.11855, Acid green 940, 4,4′-Bis(3- carboxy- 4-chloroanilino)tritylchloride, Naphthol green B C.I.10020 (12500), 4,4′-Bis[bis(2- hydroxyethyl)amino]-4”-chlorotritylchloride (12450), Filter blue green, Anthralane yellow 1, Echtlicht orange GX, Acid violet 520 Pina, N- Acetyl- 2-(2- hydroxy- 5-sulfophenyl)azo- H-acid (12510), Fuchsine acid C.I.42685 and Tartrazine C.I.19140 (60200). New Oxonole and Azo dyes such as Me 689T (12290), PSK 77 (12320), Op 450 (12330), Bch 2999 (12350), Oxonole blue (33350) and Oxonole red (05290) are developed. With the patent of Meyer/Birr on the combined ripening/antifogging action of S- Salt and Sodium benzenethiosulfonate and their mechanism, later explained by Gahler, the use of the S- Salt is much enhanced. Walter works on the chemistry of Carbazido- condensed systems with more than 1.000 condensation products of five- and six- membered heterocyclic rings with all available a,g- Diketo or similar reactive compounds. This increases the number of possible Indolizine sensitisers conspicuously. However, in consideration of the production costs, he does not find a more favourable compound than the Sta- Salt. After World War II, the Filmfabrik is transformed into a Soviet stock company. The socalled “Fröhlich- Couplers” are already replaced in copying materials with new devices. Several of them are still used in industrial production in 1990: N-(3,5- Dicarboxy- phenyl)-N- stearyl- 1-hydroxy- 2-naphthamide, N-(3- Carboxyphenyl)-2-(3,5- dicarboxyphenoxy)-2-(4- stearoylaminobenzoyl) acetamide and 1-(4- Phenoxy- 3-sulfophenyl)-3- hepta- decyl- 5-pyrazolone. The “Agfacolor- Neu” is presented to the world. It is the first multi- layered colour film with inserted couplers and it wins the Grand Prize of the Paris World Exposition. 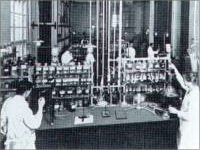 The Sodium salt of the Benzenesulfinic acid (00540, S- Salt) is used in the manufacture of emulsions as an antifogging agent since the middle of the 30′s. Later on, other film manufacturers will use the corresponding salt of the 4- Toluenesulfinic acid (12060). Through his search for stabilisers, which do not have any negative influence on the sensitivity while using Mercapto compounds, Birr comes across Triazaindolizines, which Bülow had already synthesised in 1907. The condensation product of Ethylacetoacetate and 3- Amino- 1,2,4- triazole will soon be considered to be the perfect stabiliser (12210, TM-2, Sta-Salt). Within two years it is used in all types of film and replaces the Mebi acid in the “Agfacolor-Neu” material. Thus, it permits the full benefit of the Koslowsky effect. This unique combination of Gold complex and Sta- Salt, which has been kept secret until the BIOS- and FIAT- reports were published, has been applied world- wide since 1945 in all Silver halide materials. Until 1945, China-, Oxa-, Selena- and Thiacarbocyanines in form of their Iodides, Bromides, Chlorates and Ethylsulfates are used as spectral sensitisers in all black- and- white and colour materials (12680). 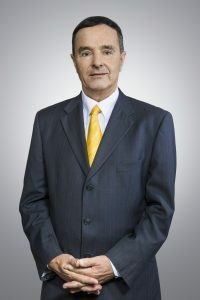 Koslowsky achieves considerable increases of the sensitivity of essential emulsions by using Gold salts, though it decreases in parts the durability of the material. At the beginning of April, under the direction of Wilmanns, the development works for the “Agfacolor-Neu” are launched. 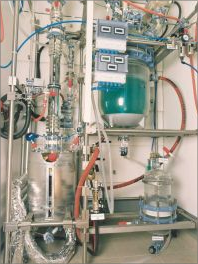 Thus, all the organic chemists of the scientific- technical department, later including Fröhlich and Kumetat, work to develop the new colour coupler system. 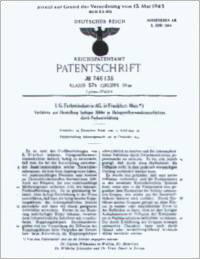 The first patent is already applied for the 11/04/35 (DRP746135). The following patents 8/08/35 (DRP 725872) and 6/12/35 (DRP 733407) pave the way for the process developed in Wolfen with colour couplers possessing long- chained diffusion inhibiting Alkyl groups and Carboxy and/or Sulfo groups for enhancing the solubility in aqueous medium. 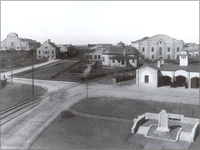 With the building of the Scientific Laboratory Dr. Wilmanns lays the foundation of a methodical photochemical research. For the first time in history, under his direction, some heterocyclic compounds such as Imidazoles, Thiazoles and Tetrazoles are used as photographic antifogging agents. Although they lead to losses of sensitivity due to the low solubility of their Silver salts, they will be the base for the Agfa- Pankinefilm in 1925. The Aktiengesellschaft für Anilinfabrikation – Agfa – starts manufacturing photographic materials at its new premises in Wolfen.